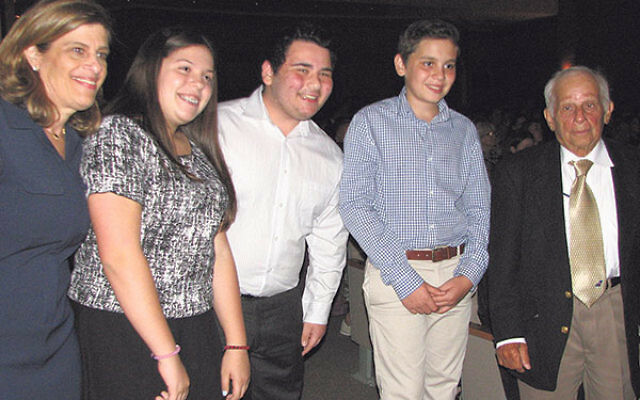 Following the screening, survivor Isadore Dresdner was greeted by JKHA principal and film co-producer Debbie Finkelstein, left, and the students who interviewed him, from left, Abigail Cohn, Jared Carmeli, and Dresdner’s great-nephew Joey Dresdner. 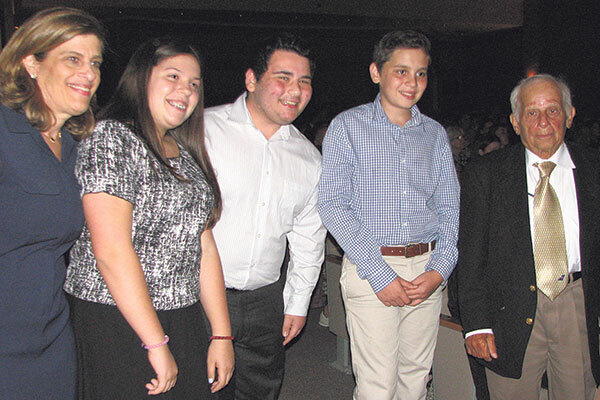 Over 350 people came to Joseph Kushner Hebrew Academy in Livingston to watch the June 1 premiere of Names Not Numbers: A Movie in the Making, the student-made documentary featuring interviews with seven people about their experiences of suffering and survival during the Shoa. In many places, learning about the Holocaust through reading books and/or watching documentaries is mandatory. Many schools and organizations invite survivors to meet with students, either one-on-one or in a classroom setting. But few students get to do what the Kushner eighth-graders have done every year for the past three years. They spend months preparing for meetings with the survivors, learning from professionals in journalism, historic preservation, and filmmaking. They then apply their new skills as they conduct their own research and read survivors’ accounts, learn how to listen and ask effective questions, and employ what they’ve learned about the art of the interview and video production techniques, spending about an hour eliciting testimony from each survivor. Then, it’s edit, edit, edit. Throughout the process, the students and their subjects are themselves documented by a professional filmmaker, creating a “making of” chronicle of the students’ work. The finished film documents the interviews and captures the survivors’ emotions as they share their respective stories and the reactions of the student interviewers. Though it includes just eight minutes or so of each hour-long testimony, the original footage is retained, with a copy for the school as well as for each survivor. Several national archives have also taken copies in previous years. At the end of the screening, each group of students presented the survivors with a framed photo of the entire group. Some of the Kushner students and two of the survivors spoke with NJJN. Kushner families have the opportunity to suggest survivors for the project, and that brought in relatives like Dresdner, Jakubovic, and Zuckerman. Some, like Szarfarc, whose daughter-in-law works at the school, have never spoken publicly. For them, receiving a copy of their testimony can be “invaluable,” according to parent Stephanie Keiser, who served as a producer on the film. All the subjects were children during the Shoa, and their experiences range from hiding with families to escaping into the woods alone, to — in the case of Halpern, who has a physical disability — being placed in a mental institution. For Szarfarc, recounting her internment in concentration camps was “very painful,” she told NJJN after the film. Although she said she “wasn’t ready” to speak, she acknowledged it was the right thing to do. “We are disappearing,” she said of the aging survivor population, and she was ultimately “really happy” she got to tell her story to the students. But she doesn’t think she can do it again. “It’s too painful,” she said. At one point during the film, as she describes her mother being buried alive, she covers her face and sobs in painful remembrance. Ed Mosberg, however, has shared his story with many people over the course of many years, addressing local, national, and even international gatherings and accompanying students on the annual March of the Living in Poland and Israel. Professionals involved included filmmaker Mikaela Floom and Wall Street Journal reporter Greg Zuckerman, whose son was among the participants (no relation to survivor Millie Zuckerman). Tova Fish-Rosenberg, director of the Hebrew language department at Yeshiva University High School for Girls in Queens, created and copyrighted in 2004 the multi-disciplinary curriculum that serves as the basis for the projects along with independent filmmaker Eric Spaar. It has since been implemented in more than 15 schools around the country. The curriculum takes its name from a line of poetry by the Israeli poet Zelda: “Unto every person there is a name.” According to the Names Not Numbers website, among the goals are “to create an emotional connection with history,” “preserve memories and emotions,” “build community between the generations,” and “give a human dimension to the lessons of the Holocaust.” Each film created using the curriculum credits the individual school along with Spaar and Fish-Rosenberg, who attended the Kushner screening and addressed the students.